Light therapy is an effective treatment for Seasonal Affective Disorder (SAD) and non-seasonal depression. If you have been diagnosed with SAD, or are feeling a case of the winter blues, light therapy could help pick you back up. With light therapy, users spend time near the fluorescent lights on a daily basis, with the lights helping to trigger chemicals in the brain that regulate sleep and mood. Often when the late fall and winter days get shorter, and there is less sun light, many people feel a disturbance with their inner biological clock. Light therapy can help get you back on track. If you are feeling anxiety over the long, dark, winter, and are having difficulty concentrating, oversleeping, gaining weight, lack of ambition to do anything or see anybody, and are depressed, you may be suffering from SAD. Light therapy will help you quickly, with some people noticing a relief of symptoms within 3 days of sitting near the light. Once you start light therapy, one of the first changes you may notice is your energy level. You may start to feel less tired and have much more energy than you have had previously. Some people have even reported seeing colors brighter and nothing seems as dull as it was during SAD. Soon after, the depression will lift and you will be able to return to your previous life. Light therapy is the most established way to treat SAD and the winter blues. Sitting by the light for as little as 15 minutes and as long as a couple of hours, on a daily basis, will make a big impact on your life. Try the NorthStar 10,000™ or the Aurora LightPad™ from Alaska Northern Lights for your light therapy. Both products are proven and dependable, with the company having provided reliable light therapy products for more than 20 years. 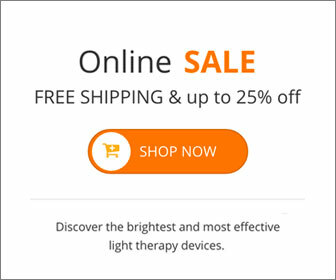 Start your bright light therapy today. This entry was posted on Thursday, March 27th, 2014 at 1:04 am	and is filed under Light Therapy. You can follow any responses to this entry through the RSS 2.0 feed.